Soak brown beans for 6-8 hours ,then pressure cook it for 2-3 whistles n drain n mash it n keep aside. Cook potato,peel the skin and mash it and keep aside. Heat oil in pan,add cumin seeds let it splutter then add finely chopped onions and saute for 1 minute. Then add mashed potato n brown beans n mix well n stir fry for a minute. After that add chilli,turmericn amchur powder n enough salt mix everything well and cook till raw smell leaves. then add the garam masala powder and stir fry for a minute. Lastly add shredded carrots n coriander leaves stir fry for a minute and turn off the stove. Thats it aloo beans carrot masal stuffing is ready now..allow to cool for sometime n divide them in to lemon size balls. This stuffing can be used for dosa,chapathi n bread rollls also. Add all the ingredients to a mixing bowl and using water make it to a little thick batter and keep aside. Heat a paniyaram pan,add few drops of oil on each groove and wait till it gets hot. ook in low-medium heat and wait till the bottom side turns brown n crisp and using spoon or skewer turn other side and cook till all sides turn golden brown n crisp. Once done transfer the low fat ABC bonda to serving plate and serve hot with any chutney or sauces. 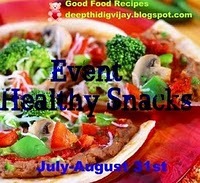 and also to the event, Healthy Snacks event hosted by Deepthi of Good Food recipes. such a wonderful n healthy bonda..love the name also!! BTW My apple payasam post,instead of condensed milk ,u can also add sugar+fullfat milk.it tastes also very nice!! WOw yummy!!!! thnX for lovely entry dear!!!! I love the funny name, kids will love it!!!! Looks fantastic. Love the name. Bondas so yummy and healthy I am loving it. I am attracted by the name of the dish. Good way of making kids to wat healthy food. Kids would love the name too. Healthy recipe, from stuffing to way of cooking..Love this version. So healthy and delicious combo !! loved the name !! Yummy bondas!! Loved the filling!! Nice name dear...Bondas look very yumm! Nice and catchy name.. Love the bondas..
ABC has me hooked !